Continuous Cleaning machines are used for continuous transport of equal or similar parts with easy surface geometry in big numbers. The machines are made from stainless steel and dispose of a solid construction with high quality components for the industrial use. The whole casing is also built in stainless steel. The tanks and aggregates (pumps etc.) are situated in the lower part of the machine. Above are arranged the cleaning cabins and optional aggregates (e.g. plume condenser, fans etc.). The machine is controlled by a programmable controller (Siemens). The cleaning machine is a closed unit. The switch case is integrated in the machine. An optional blower can be integrated to separate the rests of medium from the parts after the cleaning process. Possible processes: washing, rinsing, conservation, blowing, drying etc. Are you thinking about a continuous cleaning machine for your cleaning task? Please fill out the inquiry form. We will contact you soon. Continuous cleaning machines are employed in industrial processes, where big numbers of similar workpieces have to be cleaned continuously. The SPORER PCS GmbH is an innovative, certified company situated in Mühlental in German Saxony, who produces customised continuous cleaning machines. Our innovative force is proved by a big number of nationally and internationally patented technologies and a constant evolution of the company. The sections construction, metalworks and electronic are all centralised under the roof of SPORER PCS GmbH. 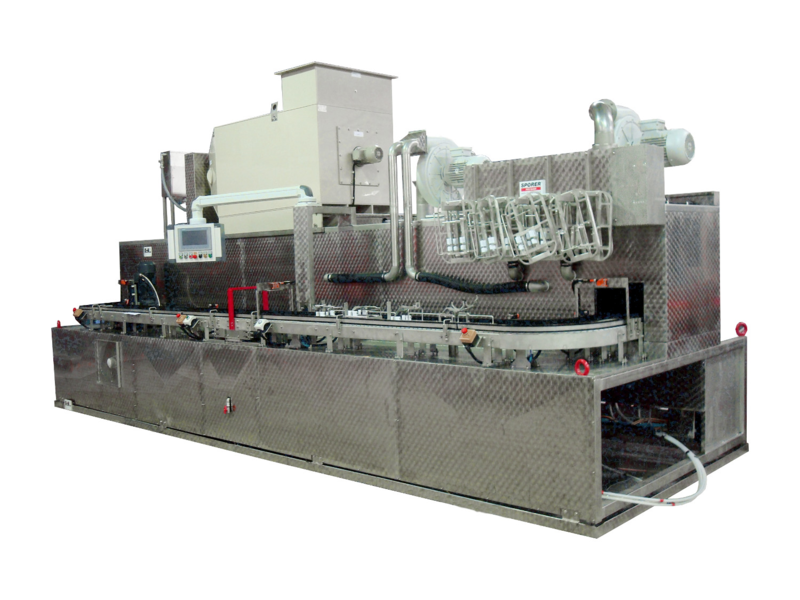 What makes our cleaning machines different? The machine is built in stainless steel. Cleaning machines from SPORER PCS are closed systems with a fully electronical controller from Siemens. All essential information is shown on the display, such as the mode of operation, the process duration, the conveyor speed etc. The workpieces are advanced by a wire mesh conveyor, a conveyor belt or a chain conveyor. All components are built in high quality material. 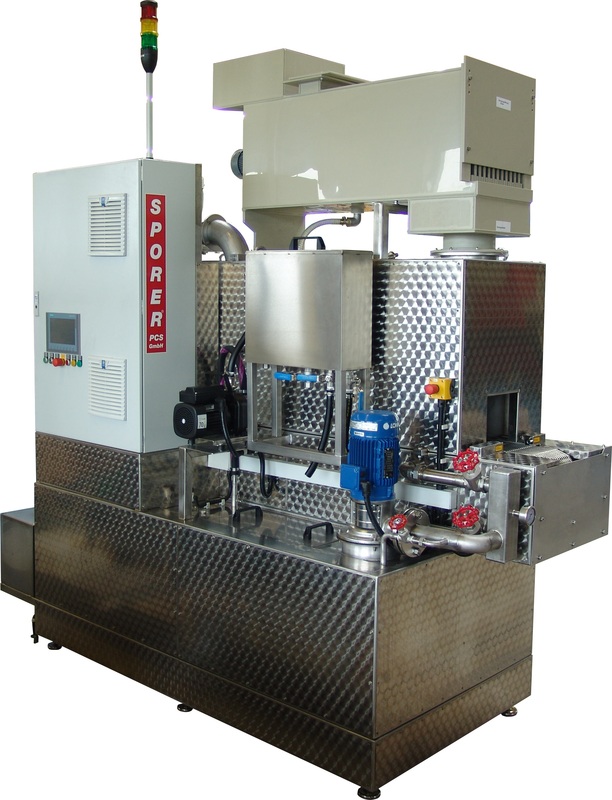 The standard equipment contains the full flow filtration in the reflux of the medium, powerful pumps, an infinitely variable conveyor speed, the electronical equipment conforms to VDE, heating cartridges controlled by thermostat and a protection from dry-running with a floater in stainless steel. Which industrial sectors employ continuous cleaning machines and for which type of workpieces? SPORER PCS GmbH produces cleaning machines, that are adopted induvial to the customer’s products and processes. That is why, there are (almost) no restrictions for continuous cleaning machines. They are employed for example in precision turneries to clean small turned parts, soiled with rests of oil or swarfs, or in packing companies to wash and dry transport boxes before they can be used again. Each continuous cleaning machine from SPORER’s is conceived for the respective cleaning task with the help of our modular construction system or it is completely customised. The modular construction system disposes of different tunnel dimensions, process elements and tanks. Which processes are integrated in a continuous cleaning machine of SPORER’s? 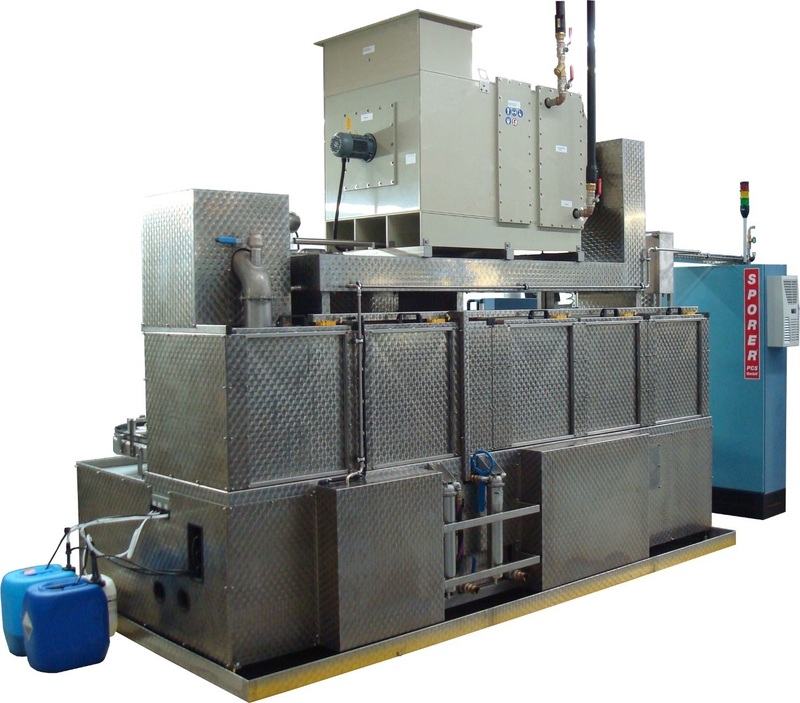 A continuous cleaning machine allows to wash, to degrease, to paint strip, to rinse, to conserve, to blow off and to dry parts. These processes can be programmed in intervals, in succession and in repetition. Different cleaning agents can be employed, depending on the parts to be cleaned. The tanks for the medium, the dirty medium and the aggregates such as the pumps are situated in the lower level of the machine. The part cleaning process is realised in the upper level inside the tunnel or the process cabins. On this level can be disposed further aggregates, such as fans and condensers. Our portfolio doesn’t contain only machines and continuous cleaning machines. Our program is completed by a capacious offer of services. This contains firstly a detailed counselling to identify the type of continuous cleaning machine and the cleaning agent that scope with the customer’s cleaning task. This choice is supported by free washing tests in our house and the possibility to rent machines for tests. SPORER PCS GmbH provides the cleaning agent and disposes the dirty medium (with the help of a partner company). In financial matters, SPORER PCS GmbH elaborates a financing concept with the customer. Each machine is controlled thoroughly before the delivery. SPORER PCS GmbH effectuates maintenance works on the delivered machines and supports the customer with an effective management of the spare parts. You can also rent our machines for longer periods.